This article is about the engine order telegraph, colloquially known as the "chadburn". For other uses, see Chadbourne. An engine order telegraph or E.O.T., also referred to as a chadburn, is a communications device used on a ship (or submarine) for the pilot on the bridge to order engineers in the engine room to power the vessel at a certain desired speed. In early vessels, from the 19th century until about 1950, the device usually consisted of a round dial about nine inches (~20 centimetres) in diameter with a knob at the center attached to one or more handles, and an indicator pointer on the face of the dial. There would also be a revolutions per minute indicator, worked by a hand crank. Modern E.O.T.s on vessels which still use them use electronic light and sound signals. Traditional E.O.T.s required a pilot wanting to change speed to "ring" the telegraph on the bridge, moving the handle to a different position on the dial. This would ring a bell in the engine room and move their pointer to the position on the dial selected by the bridge. The engineers hear the bell and move their handle to the same position to signal their acknowledgment of the order, and adjust the engine speed accordingly. Such an order is called a "bell," for example the order for a ship's maximum speed, flank speed, is called a "flank bell." For urgent orders requiring rapid acceleration, the handle is moved three times so that the engine room bell is rung three times. This is called a "cavitate bell" because the rapid acceleration of the ship's propeller will cause the water around it to cavitate, causing a lot of noise and wear on the propellers. Such noise is undesirable during conflicts because it can give away a vessel's position. Modern engine room telegraph/remote control handle in Engine Control Room (ECR) on board a merchant ship. ECR Lever is not currently active as the system pictured is in direct bridge control mode. On most modern vessels with direct combustion engines or electric propulsors, the main control handle on the bridge acts as a direct throttle with no intervening engine room personnel. As such, it is regarded under the rules of marine classification societies as a remote control device rather than an EOT, though it is still often referred to by the traditional name. This is somewhat confusing, as the classification society rules for merchant ships still in fact require an EOT to be provided, to allow orders to be transmitted to the local control position in the engine room in the event that the remote control system should fail. The EOT is required to be electrically isolated from the remote control system. However, it may be mechanically linked to the main control handle, allowing telegraph orders to be given using the same user interface as for remote control orders. 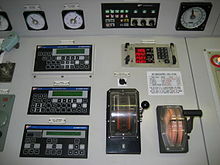 Traditional EOTs (though in a more modern form) can still be found on all nuclear powered ships and submarines as they still require an engineering crew member to operate the throttles for the steam turbines that drive the propellers. EOTs can also be found on older vessels that lack remote control technology, particularly those with conventional steam engines. 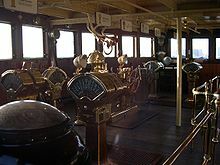 Two telegraph units and alarms must be installed, one on the bridge and one in the engine room. The order is given by moving the bridge unit's handle to the desired position on the dial face. This sends an electrical signal to the EOT placed in the engine room whose pointer acquires a position according to the signal given from the bridge. An audible alarm sounds at both ends. Accordingly, the watch-keeping engineer acknowledges the order by moving the handle of the engine room EOT to the required position and takes necessary action. This sends an electrical signal to the bridge EOT unit, causing its pointer to acquire the respective position. The alarm stops ringing to acknowledge that the order has been carried out. Finished with Engines and Standby conveyed via separate control panel. ^ "The Chadburn Ships' Telegraph Society". Retrieved 2 July 2011. ^ Halpern, Samuel (18 September 2007). "Speed and Revolutions". Encyclopedia Titanica. Retrieved 6 January 2013. Wikimedia Commons has media related to Engine order telegraph. This page was last edited on 26 March 2019, at 18:56 (UTC).